2013: The Year of the Tick? An engorged tick (grey). The small brown tick above it has not yet fed. With the return of warm weather, many of you here in North Toronto will be spending a lot more time outdoors on walks with your canine family members. You might be surprised when your canine companion brings home some uninvited guests; TICKS! Experts note that tick population ranges have been expanding and predict that tick populations will increase will increase dramatically in many areas of Southern Ontario this year. So why are ticks suddenly a problem? There are several reasons and increased populations are likely the result of a combination of factors such as warmer than average winter temperatures, migratory birds, rodents, coyotes and other wildlife which are vectors (carriers) for ticks. Ticks will climb to the tips of grasses and shrubs and then hop on to whatever animal brushes by. They will then bury their mouth parts into the unsuspecting victim, inject some saliva to prevent blood clotting, and begin to feed by sucking the blood of the victim. This is when the disease transmission can occur. 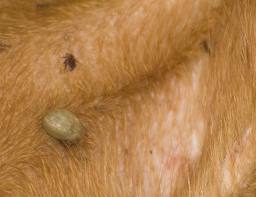 Most ticks will feed for several days before they become engorged and easily noticed (see images). Over the past few years, the Orchard Grove Animal Clinic team has seen a marked increase in the number of tick cases on our canine patients. Many of these dogs had never left our north Toronto neighbourhood. The most concerning fact is that several of these ticks tested positive for Lyme Disease. We have also seen a case of Erlichosis, another tick borne disease. Obviously. ticks are more than just an annoyance, as they present a serious health risk to both you and your pet. Tick borne diseases such as Lyme, Anaplasmosis, Erlichicosis and Bartonellosis can be difficult to diagnose and treat so TICK PREVENTION and quick removal are the best treatments. 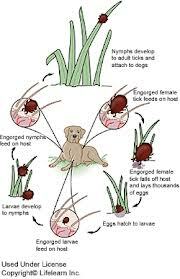 Life cycle of the dog tick. frost returns. In addition to tick prevention, we recommend that all dogs be tested for tick borne diseases at the time of the annual Heartworm or Wellness blood test. The test can be performed on the same sample so no extra poking is required! We also advise that you check your dog for ticks every time you come back from the park or a wooded area…..or even your back yard. The best way to do this is just to run your hands over the entire body. 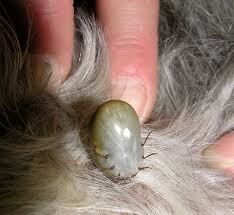 Ticks attach most frequently to the head, ears, neck and feet but can be found anywhere on the pet. What do they look like? Ticks are most often describedto us as a brown or dark grey “skin tag” or small “growth”. When they have been attached for longer they are blood engorged so can be considerably larger than this. If you find one don’t squeeze it. If you do the tick might inject disease causing organisms such as bacteria, viruses, protozoa or other agents into the dog, or contaminate your hands. Ticks need to be removed by pulling off directly without and turning or twisting. We use a special tool to do this and it is usually just best to have us remove it. Once removed, we send the tick to the lab for testing to see if it is a carrier of any of the above mentioned diseases. If we receive a positive test, we can then implement the appropriate treatment right away, before the disease has time to cause any damage to your dog. In 2012, Toronto had over 100 positive Lyme cases in addition to lower numbers of Anaplasmosis, Erilchosis and Bartonellosis. Don’t let your dog become a statistic! Please give us a call to set up your dog’s tick prevention program today.